Using Graphics In Books is an attempt to get the basics of book graphics, blog graphics, and general use in HTML into a small volume people can use as a reference. It contains explanatory graphics and clear instructions—though there are no tutorials for specific software, outside of a little Photoshop. Tired of bad graphics in your books? Blurry covers with no small detail? 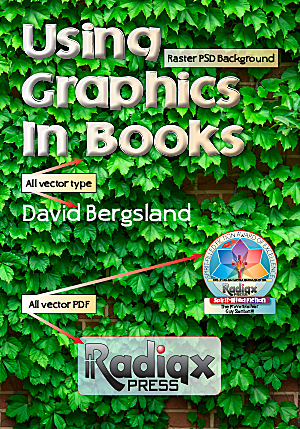 This book will show you the two different types of images: vector and raster [Illustrator/InDesign or Photoshop/GIMP/whatever]. You will learn what is required for print and for ebooks. You will see the different file formats required by each. And, finally, you will be shown what is required [or preferred] by the various self-pub suppliers. I share the formats used and talk about the applications which can produce them. These are the formats used with Word, Scrivener, word processors, InDesign, WordPress, Websites, or in any digital documents. The author has nearly 50 years experience both doing and teaching these materials. He began teaching digital publishing in 1991 using Word, PageMaker, QuarkXPress, and Photoshop [plus FreeHand & Illustrator]. He taught these things at a college level in the Business department at a large community college for nearly 20 years. You’ll learn what you need! Many self-publishing authors are confused by using graphics in books: print and ebook. Many of you are using Word or Scrivener. Some are using more professional graphic solutions. No matter what you use, there are only about six formats available: PDF, PSD, AI, JPEG, PNG, and GIF [SVG is not commonly used yet in 2016]. It briefly explains how to save the best quality images. And finally it covers what the various self-pub providers require [or strongly prefer] for graphics. It will answer your questions, or at least get you far enough along to ask me for details. Who am I? I’ve been doing this stuff since 1967, and I’ve run a publishing house full-time since 2009. I’ve got 25 years in digital publishing—teaching it at the college level for nearly 20 of those years. I started with Word and PageMaker, plus QuarkXPress in 1991. I wrote the first textbook for InDesign, starting in 1999 [I won’t link to it because it is one of those very embarrassing early efforts we all have in our careers]. Available at Amazon, iBooks, Nook, Kobo, and the rest of the D2D distribution. Plus, I have a DRM-free archive with a PDF and the ePUB at Gumroad. The ebooks are $2.99, with a paperback price of $14.95.